New York, USA, 29.1.2012. 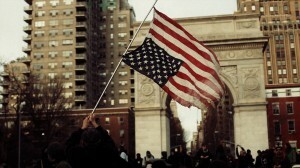 The Almighty delivered splendid weather on Sunday, January 29th, 2012, when Occupy Town Square, an OWS (Occupy Wall Street) affinity group, produced a “pop-up occupation” in Washington Square Park. It was a beautiful afternoon that succeeded in re-establishing OWS as a powerful (albiet formerly dormant) force around the world. The Occuponics continue to write and perform “on the spot,” improvisational Occupy Wall Street music and the group did its thing at The Peoples’ Stage (AKA The People Staged) and, earlier, before the valorous Daniel had gotten the People’s Stage banners up, with the splendid drum circle featured in this video, featuring Brendan Rooster Hunt, Saeed RB, John Eustor, and other members of the famous “Pulse” percussion cooperative, which gave OWS its heartbeat in late 2011. We salute the OWS Drum Circle (AKA “Pulse”): these are valiant soldiers of rhythm who have given so much to Occupy Wall Street and have paid a price (three drummers were arrested on Saturday at Zuccotti Park (AKA Liberty Square). We hope these artists are released from jail soon. They were playing quietly and meant no harm to anybody. Today’s WSP (Washington Square Park) Occupy Town Square event happened without arrests and was a beautiful model for future “pop-up” occupations that combine arts, culture, teach-ins, and be-ins for the public good. 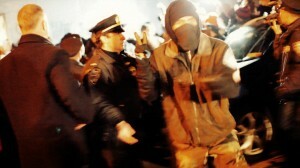 Tagged as: "American Spring", "demonstrators in Oakland", "Occupy Town Square I. 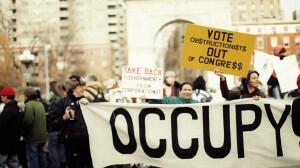 ", "Occupy Wall Street", OWS "anti capitalista"